Hi all, my name is Jill and I live in Feilding, a small town in the Manawatu, New Zealand. I have a husband, teenage children, 2 dogs, a cockateil and a grwing number of fish. I started off a couple of years ago with a 200ltr tank with 6 small goldfish .....but alas they grew and were very messy so a few months back after they kept spawning and ripping up all the plants we dug a huge 2500ltr pond. I moved them outdoors but not before they produced a few fry which are now growing in the 200ltr tank and waiting for the weather to warm up so they can go outdoors too. I found out that tropicals make less mess and are much easier to care for so became impatient for the little guys to move out so I could make the big tank tropical. I bought a 70 ltr jewel rekord tank and now have 5 angels (small), 1 dwarf gourami, 3 harlequin raspboras, 1 kribensis, and 2 bristlenose happily occupying that. I then bought another second hand 60ltr tank and have neon tetras, glowlight tetras, 1 krib female(she beat up the male, that is why he is in the other tank) 3 swordtails 2 baby bristle nose and a common pleco about 5 inches long. I also got 6 guppies but alas they got sick and died taking with them a neon and a glowlight so I am learning quick about the need for a quarantine tank. I have now just had the luck to buy a huge tank, I have a big wall space that has been waiting for a big tank and I have certainly found it. I am now the proud owner of a 1300ltr 8ft x 3ft x 2ft tank which comes complete with 2 x fluval fx5 filters and a huges stand and hood. I am dying to get it set up but I am waiting on some strong men to lift the tank into the stand. It is very heavy. I am still trying to decide what to put in it, a big community or what? My angels certainly need a bigger tank. I am so excited about this tank and will post a pic of it when it is up and going. I have found reading these forums very interesting and informative, any advice or suggestions on fish to move into my new tank are most welcome. Welcome to the site! I think you should put SW fish and corals in it! 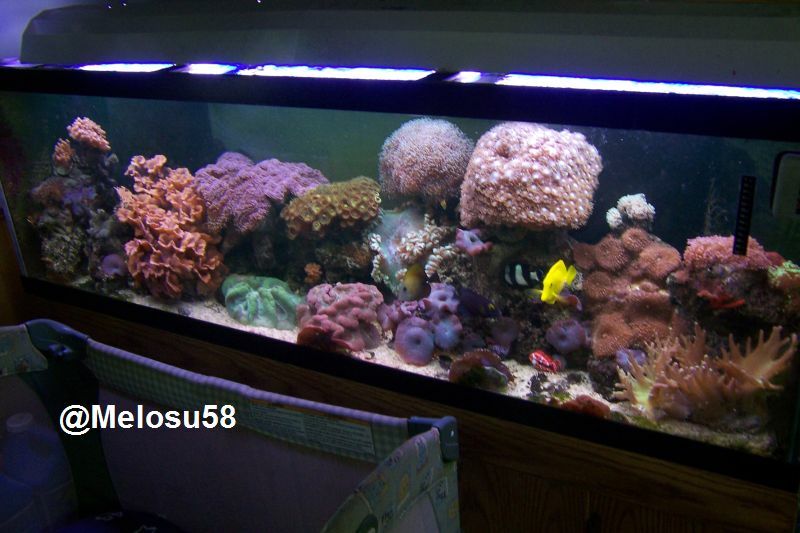 I can just image an immense reef in that giant tank of yours! You could move a recliner in front of it and pretend you were on the great barrier reef! haha. Sounds like you have quite a decent variety of fish there. One question.. Is your female kribensis bigger than your male? 7 Gal ,2 Amazon Swords, 1 X Anubias, 1xM 1xF Kribensis, 1 250L/Hr Aqua One filter,1 x 55W Aqua One heater, Ammonia: 0.25, Nitrites: 0, Nitrates 0, 26C / 78F, Ph dropping from 7.2 to 6.8 currently: 7.0. Post in the FW fish forum for suggestions!